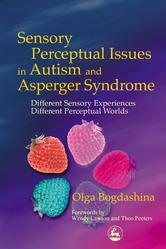 The author attempts to define the role of sensory perceptual problems in autism identified by autistic individuals themselves. Reports the 'unusual' sensory perceptual experiences that may involve hypo- and hypersensitivity, fluctuation between different 'volumes' of perception and difficulty interpreting a sense experienced by autistic people. The final chapters are devoted to assessment and intervention issues with practical recommendations for selecting appropriate methods and techniques to eliminate the problems and enhance the strengths.